I’ve just returned home from attending NCTE in Chicago. This year, the most powerful learning experience I participated in while at NCTE wasn’t a formal workshop, keynote speaker, or session. It was a hackjam hosted by the National Writing Project and organized by an intrepid doctoral student named Andrea Zellner. I left the hackjam feeling incredibly energized, inspired, and full of ideas. As I flew home, I wondered why participating in the hackjam felt so different from the other more “traditional” sessions that I attended? After reading my notes from the day’s events, here’s what I came up with. I found out about the hackjam via Twitter just a few hours before it was to begin. I’d spent the morning in the stuffy, wallpapered, and windowless conference rooms of the Chicago Hilton (where most people didn’t have projectors or screens, and where you couldn’t get free w-ifi), so when I read that the hackjam would take place at a nearby cozy corner bakery (with free wi-fi), I was sold. Plus, attending an “unsanctioned” event outside an “institutional” space made it feel slightly subversive—this was grassroots professional development! Other than Andrea’s instructions to “hop onto hackasauras, and open up another window for the New York Times”, there were no formal directions, no slideshow, no rubric, and no handouts. Rather than listening to someone give a talk, we were required to learn by experimenting with hackasaurus and by collaborating with each other along the way. Both the power (in terms of decision-making) and the cognition were equally distributed among all of the participants. And this redistribution of the teaching load really energized people because it allowed them to share their knowledge based on the specific questions and needs of others. In the hour I was there, I not only learned about hackasaurus, I was also shown how to create a screen capture on Jing, how students can use flip phones to create their own documentaries, and how to start my own YouTube channel (!). From what I gathered along the way, our final “product” was to remix a webpage and publish it on Twitter. But, participants also documented the learning process by tweeting throughout the event. For example, nooccar tweeted “Wishing corner bakery wifi wasn’t dead.” AWhite 100 tweeted, “Having fun with Hackasaurus. Thinking edu possibilities” and so on. We also didn’t wait until everyone was finished to share our products. Once someone created a hack, they shared it via Twitter. This allowed people who arrived later (or those like me who worked a little more slowly) to see other finished products along the way. Later that night, I whipped out my phone to show my roommate (who isn’t on Twitter) my project. I loved having an actual product to share with her to better help explain what exactly I’d been doing at a hackjam. Since we were all sitting so closely to each other, it was easy to glance at each other’s screen and make comments on each others’ work. So even though I quickly realized that I was surrounded by people far more tech-savvy than I, they were interested in what I was remixing and asked me questions about what I was doing. 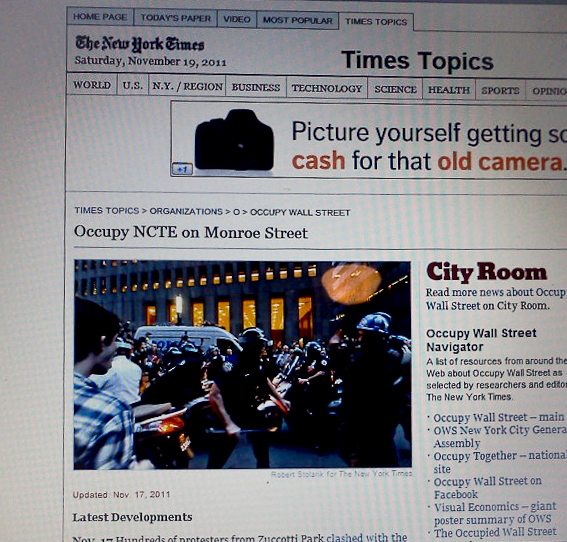 For example, when I changed the headline of the New York Times page from “Occupy Wall Street” to “Occupy NCTE on Monroe Street,” my neighbor asked, “Now are you going to change the picture?” I thought about it for a minute. I could see what he was saying; it might be funny to include a picture of us all at our laptops, but I actually thought it would be interesting to have this rather violent image of police force juxtaposed with the text of English teachers—usually a pretty calm and well-behaved group. While these were more informal comments, there was also the more formal feedback available once we published our remixed page on Twitter. People favorited, retweeted, and commented on the hacks. In this way, you had a fairly good idea about how much of an impact your “message” had made. Knowing that my colleagues (and lots of other people I admired) would see my hacked page provided some serious motivation to come up with something that other people might find interesting or amusing. This pressure to appear at least slightly funny or clever was evident in a comment made by one of the participants. After publishing her remix and then seeing what everyone else had made, she said sheepishly, “I did the stupid one.” While we assured her that we were all just “playing around,” her comment demonstrated the importance of writing/creating for a real audience. It is entirely possible that this hackjam came along right smack dab in my Zone of Proximal Development with regards to my learning about literacy and technology, providing me just enough of a challenge, without being too difficult to accomplish. Yet, other participants (those far more experienced than I) expressed similar feelings of excitement and energy as they left the session. There was a sense of empowerment and possibility that I didn’t feel leaving any other sessions. Maybe it was because we actually produced something (however insignificant) in the hour we spent together; maybe it was the networking or collaboration, or perhaps the powerful combination of sugar and caffeine. All I know is participating in my first hackjam gave me a lot to think about in terms of designing meaningful digital literacy learning experiences; I can imagine that holding hackjams with students would not only help them learn about how the invisible world of the internet operates, but might also provide opportunities for discussions about issues of media representation and power, and the importance of becoming both responsible producers and consumers in the digital world.